Skulls and skeleton bones combine to create a chopper that's fit for the Grim Reaper himself! 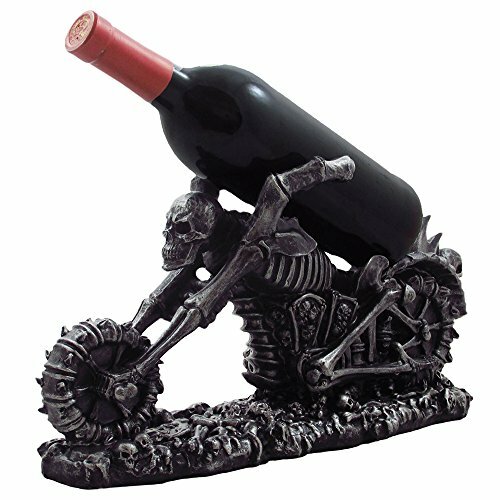 This fantasy motorcycle sculpture serves as a wine bottle holder with chillingly intricate skeletal details. Riding atop a graveyard of skulls and bones, this gothic "death bike" statue is certain to be a much talked about conversation piece as it delivers the wine to your next party or social event. Skulls and skeleton bones combine to create a chopper that's fit for the Grim Reaper himself! - See full description below. Dimensions: 15 3/8" x 4 5/8" x 7 7/8" high. Weight: 3.4 lbs.